The issue at hand is cops goofing around on social media. 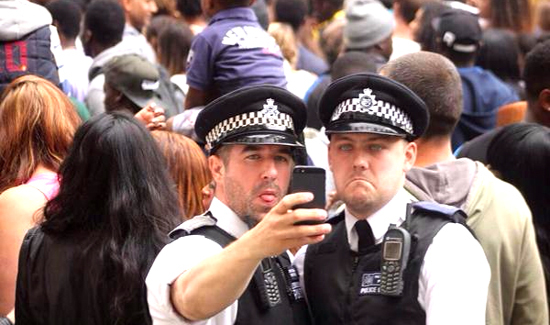 In the United Kingdom, older cops say the younger ones don’t understand the seriousness of projecting an image of authority. Many veteran British officers say that seeing their younger peers wearing high heels, bear costumes, and other stuff on social media are a laughing stock. For younger folks, there’s nothing unusual or unprofessional about taking pictures of male cops in high heels to promote awareness of domestic violence. If a 23-year-old sees a cop with fingernail polish in a “We’re going to nail the criminals!” meme, they don’t give it a second thought. But some older coppers on the job wonder if turning police departments into meme factories and advertising agencies is the right way to go. “This worrying report shows exactly why police chiefs should be targeting their resources on catching criminals rather than silly stunts. Gang members and other criminals will only be caught if officers are allowed to spend their time doing their job, rather than being encouraged to engage in gimmicks,” Tory MP Andrew Rosindell told the Daily Mail. There are two reasons this is getting attention now. First, there have been reports that U.K. police are not doing enough to fight human trafficking and that officers don’t take the issue as seriously as some would like. The second part is the small increase in rates of crime in the U.K.
“They have forgotten what their purpose is,” Mick Neville, a retired senior Scotland Yard detective, told the Daily Mail. What no one seems to be able to remember is that social media is a two-way radio. For instance, police in Gloucester posted a video online promoting Hate Crime Awareness Week. Then people pointed out the obvious irony of cops saying they were not investigating hate crimes but instead going after their social media critics. There is a lot that’s different when it comes to policing between here in the States and across the pond. But one thing that’s the same is that agencies and officers continue to struggle to leverage the power of social media for PR purposes without getting into Twitter wars with non-police.